There were many magical moments at the My Own Two Hands art auction and party Saturday night. The event grossed $135,000 to support the programs of Sisters Folk Festival - which is magic enough on its own. Then there was the bidding war for a masterpiece by noted Northwest artist Rick Bartow, a $10,000 paddle-raise donation by Ken and Ginger Harrison and the vision of three generations of Sisters folks dancing the night away to the fiery bluegrass of Frank Solivan & Dirty Kitchen. 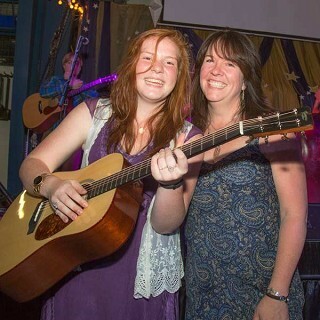 But nothing could surpass the magic of the sale of Preston Thompson Guitars' donation - a dreadnought guitar. For the first time this year, MOTH featured a kind of raffle. Patrons entering Ponderosa Forge for the auction could buy a playing card for $100 - with 52 in the deck, that added up to $5,200. A winning card was drawn out of a hat, with the winner getting $5,200 in credit to spend during the auction. The winner was the Queen of Hearts, purchased by Heidi Ellsworth of Camp Sherman. But Heidi was hidden in the dark of the Forge, strangely quiet. High school students paraded the art before eager bidders, who snapped up paintings, sculptures, a custom knife, a sword, wood benches... Auctioneer Jeff Mornarich tried to coax her into the action to no avail. What he did not know was that Heidi had a plan. Heidi is the mother of Megan Ellsworth, one of the standout students in the Sisters Americana Project, the musical education outreach program in Sisters schools, which is supported by Sisters Folk Festival. Not only is she a dedicated singer-songwriter whose talent is blossoming in the program, says SFF Creative Director Brad Tisdel, she's one of the students who does the most to promote the culture of the program in Sisters High School. "Whenever we need a student ... to roll up her sleeves and get to work, she's that student," Tisdel told The Nugget. She not only performs in the Americana Project, she also teaches younger students guitar. Heidi was biding her time, waiting for the Preston Thompson Guitar to come onto the auction block. Thompson donated a dreadnought guitar to this year's MOTH auction. Patrons got to hear just what that instrument could do, listening to Chris Luquette, guitarist for Frank Solivan & Dirty Kitchen, play an identical instrument on stage. Preston Thompson Guitars is developing a signature series with the 25-year-old guitar-slinger. Megan was the student tapped to display the guitar. As she held it up for the crowd's viewing, the bidding got started. And Heidi showed up. The plan was in action. She later told The Nugget that as soon as Tisdel drew the Queen of Hearts from the hat, "We had the guitar." Megan knew something was up, and her joy was evident as the gavel came down at $4,750 - and she knew she was the owner of an exquisite custom guitar. "There's songs in that guitar," Tisdel intoned from the stage. And Megan Ellsworth will be the one to write them. In fact, she was pretty sure she wouldn't get any sleep that night. She had a guitar to play. Megan came to Sisters High School from Black Butte School in Camp Sherman. Music is a big part of her family's life, and since she was a little girl she's turned out for local music events, including the annual barbecues at Camp Sherman Store. "She's absorbed this culture for so long, for her to be a part of it now is amazing," Heidi said. A junior, Megan has another year to contribute to the Americana Project before going out into a wide musical world - playing an heirloom instrument that came into her hands on the turn of the Queen of Hearts.